Capt. Ronnie Daniels of Fisher-Man Guide Service enjoys targeting tripletail on a trip, but often uses them as a bonus after a morning of chasing reds and specks. 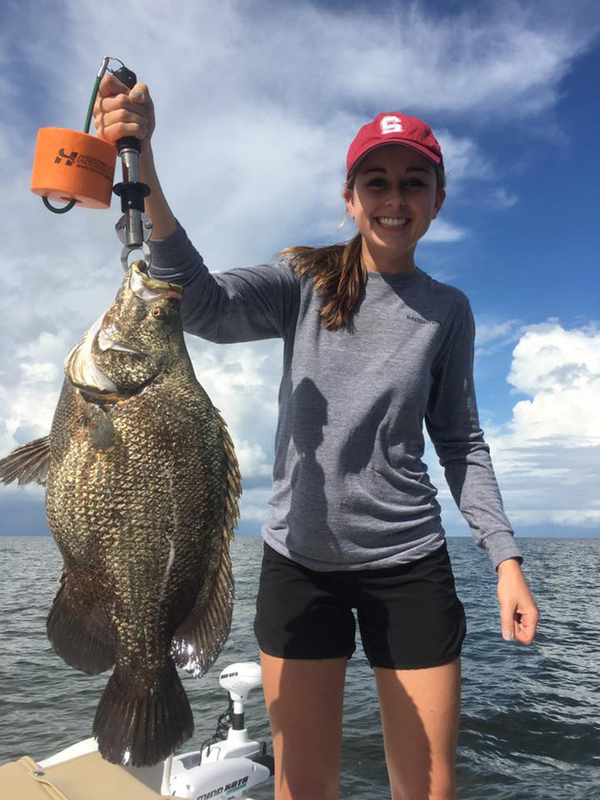 Tripletail are usually willing to bite if you can find them and flip a live shrimp into their sight line. Though sometimes solid black, hence the nickname “blackfish,” tripletail come in different color patterns, like this interesting mottled look. Keep a sharp eye out for tripletail when you leave the dock in Biloxi; they provide some great, late-summer sight-fishing opportunities. 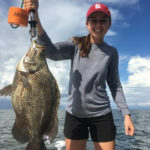 But the best sight-fishing experience for those who spend a lot of time on the water might be for tripletail, aka blackfish. Tripletail enter the Mississippi Sound and Biloxi Marsh areas in the late spring and stick around all summer, until the water temperature drops below about 70 degrees. September is a great month to target them before they head for deeper water. These fish are hard fighters, tasty on the table and, this time of year, they’re easy to find. 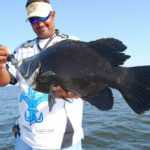 For Ronnie Daniels of Fisher-Man Guide Services out of Pass Christian, tripletail are the ultimate sight-fishing quarry. 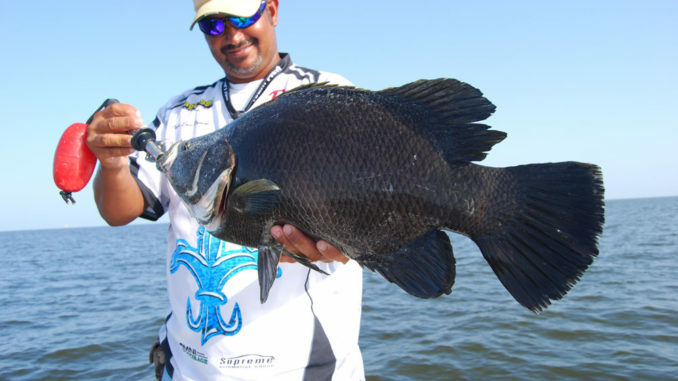 “Tripletail are a somewhat mysterious fish that a lot of people don’t know much about,” he said. “They look a lot like a big, black crappie. They like to hang out under anything that’s floating, anything providing shade. They’ll lay on their side just under the surface. Instead of checking electronics for telltale signs of structure, baitfish or temperature breaks, finding tripletail is as easy as finding anything that provides underwater shade. That’s another pleasing aspect of the sport: You can do it running at speed, which is great on a hot summer’s day. When he finds a tripletail, Daniels likes to have his clients is usually visible through the entire process. Once the shrimp is in position, he advises anglers to resist the urge to do anything other than let the current carry the bait to the fish. Once the fish sees the shrimp, the hardest part for anglers is the waiting. You’ll see the fish react to the shrimp as it turns its nose toward the bait. It might look at it for several seconds from an inch away before it actually bites, so anglers need to be patient but ready to set the hook. When it comes to tackle and rigging, Daniels prefers three different setups. For all of them, he uses 7-foot-2 custom Parker rods and 3000 series spinning reels spooled with 40-pound braid and 40-pound fluorocarbon leaders. He calls his first setup a free line; he splices the fluorocarbon leader to the main line with a knot, then puts one small split shot weight about a foot above the bait, which is impaled on a No. 8 treble hook. In his second setup, Daniels uses an Oddball popping cork with a 12- to 18-inch leader tied to the treble hook. The third is a slight variation of this, using a 3-foot leader under the cork. This one is for fishing around floating objects when the tripletail get spooked, dive and are hesitant to return to the surface. It doesn’t take hours riding to check crab-trap pots and find fish; Daniels said if you’ve got a good pair of polarized shades, you don’t have to slow down very much to spot these fish, and they aren’t as easy to spook as many folks think. “When I’m looking for these fish, I’ll run down the line of floats anywhere from 26 to 34 miles an hour, depending on what the water conditions will let me see. As long as the splash of your boat doesn’t land directly on top of the fish, it’s not a problem. Even if the fish go down in the water column when you pass by, they’ll come back up, and you can still catch them. Mark Wright of Legends of the Lower Marsh Fishing Charters in Pass Christian said the trick is to stay on plane while checking floats. 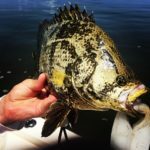 Daniels said that while floats are easy to find and predictable places to find tripletail, anglers shouldn’t ignore other types of floating debris, no matter how small or unnatural. “We’ve caught tripletail under a discarded surgical glove before,” he said. “Half a watermelon, floating plywood, anything on the surface that creates shade — you need to check it out. Sometimes even a small clump of floating grass will have two or three tripletail under it. Wright agrees that anglers shouldn’t pass up anything offering shade. Even fixed vertical objects like PVC pipe that’s stuck into the bottom to mark areas like oyster beds will hold tripletail. Wright also likes live shrimp for bait, and he said small, live menhaden are good bets, too. He prefers to free-line his bait with a single split-shot when he’s able to see the tripletail just under the surface, but he will use corks when the fish don’t show themselves. 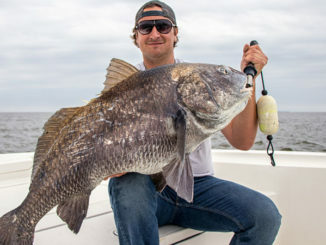 Both captains agree that one of the biggest mistakes anglers make is not realizing that more than one tripletail is often under the same floating object. They advise anglers to keep their eyes peeled for a second or third fish once they spot one. When you see more than one, the other fish will usually stay put once the first hooked fish is out of the way. 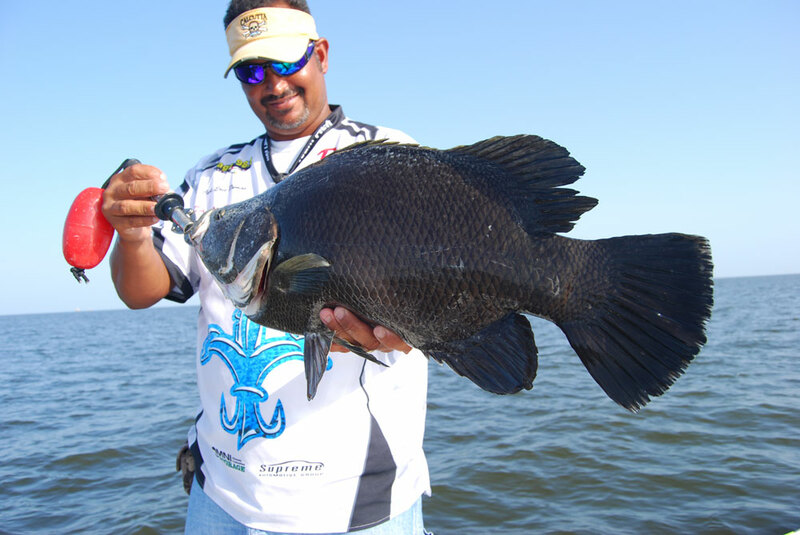 Once the initial tripletail is in the boat, cast another shrimp as quickly as possible. Chances are high that you’ll catch that second fish, and it’s not at all that uncommon to hook the third one as well. For information on Capt. Ronnie Daniels’ Fisher-Man Guide Service, call (228) 323-1115 on visit his website at msfisherman.com. For information on Capt. Mark Wright’s Legends of the Lower Marsh Guide Service, call (228) 324-7612) or visit legendsofthelowermarsh.com.